Shown on CBBC at 11:30 GMT – not half an hour ago – got to love the speed of the Internet. This brand new clip features the newly regenerated eleventh Doctor and Amy Pond (presumably no relation to the duck pond in the clip) debating whether the pond in question can really be a duck pond even if it never has ducks. BBC America has started airing their own trailer for the new series of Doctor Who, featuring Matt Smith as the eleventh Doctor and Karen Gillan as Amy Pond. This new trailer includes new footage not seen in the recently released BBC trailer, so more freeze-frame fun for us fans to over analyze the footage to tide us over until the series begins in April. “The Universe is vast and complicated. Sometimes, impossible things just happen and we call them miracles. New Doctor Who series producer Steven Moffat had a chat with the folks on BBC Breakfast this morning about the new series and has a few words to say to calm the fears of fans who are worried the new Doctor can’t be as good as the old one. The new Doctor Who Series 5 (or 31, depending on how you’re counting) trailer which was revealed at the end of yesterday’s the Eleventh Hour premiere in Cardiff has made it onto YouTube. 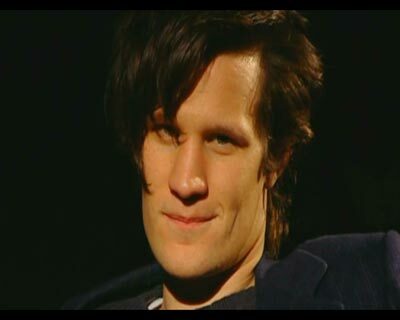 It features a voice-over from new companion Amy Pond which leads into a voice over from the Doctor. Very exciting: the first episode of Matt Smith’s first series of Doctor Who has premiered in Wales at a BBC press launch today, March 18th. A number of clips from the premiere (or related to it) have been posted to YouTube already and I’ve gathered several here for you to view. Warning: contains minor spoilers for the episode and the new series, but probably nothing you haven’t heard already. The BBC has released a preview of the upcoming Doctor Who special “The Waters of Mars”, which is set to air “Novemberish” according to exiting producer Russel T. Davies. You can view the clip below, assuming the BBC doesn’t yank it from YouTube. 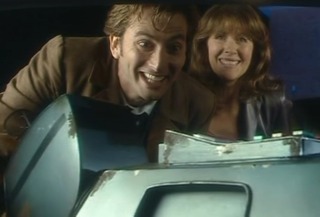 The BBC Press Office is has announced that David Tennant will be appearing in two episodes of the upcoming series of The Sarah Jane Adventures. John Simm and Bernard Cribbins Confirmed for Doctor Who Specials. Donna and others to Follow? Well, it’s official. Not only is Bernard Cribbins appearing in one of the final David Tennant stories, but on-set photos also show John Simm has returned to Doctor Who! 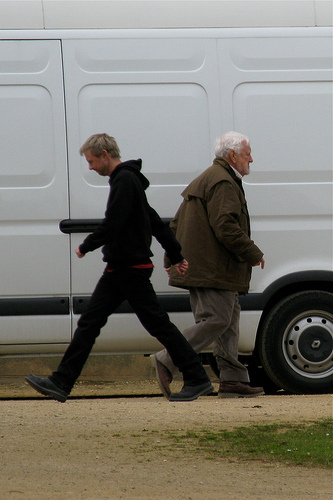 The image at right (credit for the photo goes to alun.vega) shows Cribbins and Simm passing each other on-set. It’s official. As I mentioned in yesterday’s article “11th Doctor to Be Announced Saturday” the BBC has announced the actor to play the 11th Doctor on Doctor Who, replacing departing Doctor David Tennant. The BBC has stated that they will be officially announing the name of the actor who has been hired to play the eleventh Doctor. The new actor was cast last year, and the BBC uncharacteristically was able to keep the lid on the secret through the holidays.